The Russo-Finnish war proved the soundness of the decision to manufacture the KV-1. However, when encountering difficulties on the heavily fortified Mannerheim line during the Winter War in Finland, the General Staff demanded a specially equipped version fitted with a heavy howitzer, intended to deal with concrete bunkers, in support of the regular KV-1 units. Instead of choosing the more pragmatic solution of a traditional SPG, they decided to use the same turret ring to accommodate a fully traversed, redesigned turret that housed the gargantuan howitzer. 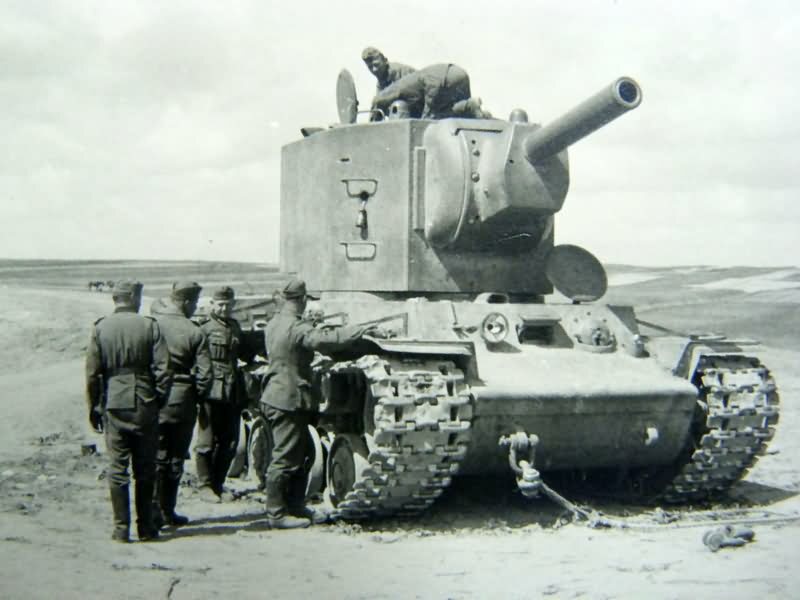 This gave the KV-2 an unmistakable profile, with its towering turret, which was only accessible by a ladder – an obvious target which was also notably top-heavy, compromising the lateral stability of the tank while crossing a sloped terrain, a problem which would later haunt Soviet tank crews. All these deficiencies were taken into account when the factory was relocated in the new “Tankograd” complex at the steps of the Ural. However, production was no longer maintained. Only 203 were built in all from late 1939 to mid-1941. The North-West front headquarters and the Commander of the Seventh Army, Kiril Meretskov, made forceful requests for a bunker-busting heavy tank. Several projects were then undertaken. In one of their last projects before disbandment, the OKMO team revived the T-100 hull and mounted a B-13 130 mm (5.12 in) naval gun, designating it the SU-100Y. However, this was rejected because of the army’s lack of barrels and naval semi-armor piercing rounds, at a time when the Soviet Navy was beginning a massive expansion in order to create a more powerful, ocean-going fleet. Somewhat more pragmatically, Zhozef Kotin’s team, at the Kirov Plant in Leningrad, developed two designs based on the already battle-proven KV chassis, which made more sense in terms of streamlining production costs. There was an initial attempt to mount a 152 mm (5.98 in) BR-2 and a 203 mm (8 in) B-4 howitzer on a lengthened KV hull, but this was never completed. The third design was the design which was chosen. Completed in two weeks, it had a 152 mm (5.98 in) howitzer with two DT machine guns mounted on an unmodified KV chassis. It was accepted for production and designated the KV-2. First trials were conducted on 10th February, 1940 and shortly after, two prototypes were sent to the front on the Karelian Isthmus. However, there is some debate as to whether these prototypes saw combat. Recent evidence suggests that Meretskov’s and others’ reports on the excellent results achieved by the KV-2 against fortified positions and pillboxes referred to tests conducted against already captured positions. The KV-2 had one of the most unique silhouettes of WWII. The hull was no different to that of a KV-1, but in order to fit the 152 mm (5.98 in) L20 howitzer, a box shaped, 12.9 tonne turret was mounted. This now made the vehicle stand 4.9 m (16 ft) tall, compared to the 3.9 m (12.8 ft) height of the KV-1. However, the high profile of the KV-2’s turret was compensated by its immense armor – 110 mm (4.33 in) frontal armor and 75 mm (2.95 in) side armor. In October 1941, KV-2 production was halted as Soviet factories relocated and were moved eastwards to avoid German capture. Designation of the two models varies between sources and can be confusing. 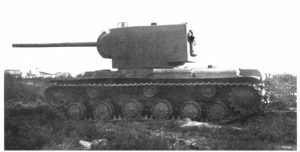 The earlier model of the KV-2 had a turret with a sloped front with rivets and only featured one DT machine gun in a hull mount. It weighed 53.8 tons, and was the lesser produced model. In German sources, this variant is referred to as the KW-II. 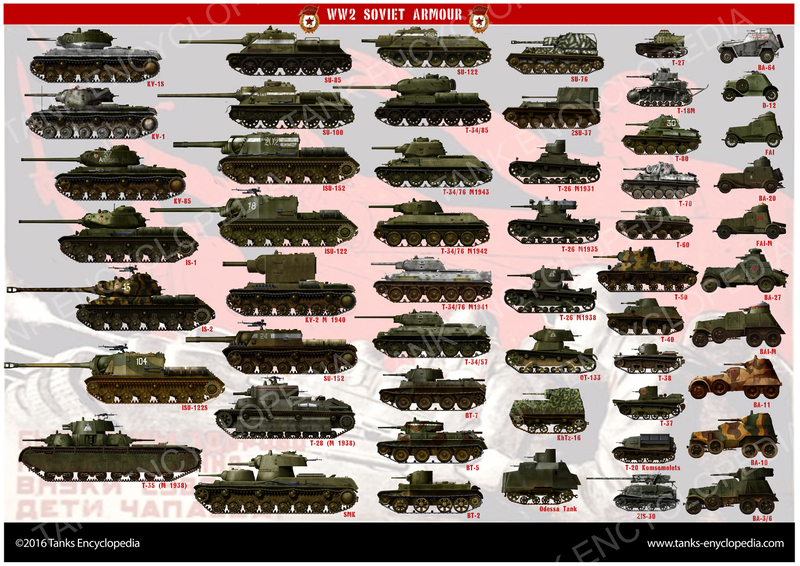 This model is sometimes erroneously called the KV-2 M1939 or KV-2 M1940. The turret is often wrongly called the MT-1, but that is the designation of the gun mount, not the turret. Sometimes the MT-10 designation is also wrongly used for the turret, and this seems like a mix of the mount name and the gun name (MT-1 + M-10). The turret was actually simply called “big turret” (большой башней). The later variant of the KV-2 featured the more common and boxy turret, featuring a second DT machine gun in a rear mount, and an improved rear turret hatch that made resupplying ammunition easier. The armor was kept the same, but thanks to the removal of the angled turret front, it had a much roomier crew turret, meaning that working conditions were better for the crew, especially the loaders. In German sources, this variant is referred to as the KW-2B or KW-IIB. It is sometimes wrongly designated as the KV-2A, KV-2 M1940, KV-2 M1941 or KV-2B. The turret is often erroneously called the MT-2, seemingly as a progression over the wrong MT-1 designation of the previous turret. The turret was also simply called “reduced turret” (пониженная башня). Very few early production models were fitted with the 122 mm (4.8 in) 1938 L/22.7 howitzer fitted to the earlier turret. The number produced is unknown, but were very limited before they were upgunned with the 152 mm (5.98 in) howitzer. An unknown number of KV-2s were captured by the Wehrmacht. They were sent to Berlin for tests before they were fitted with a new commander’s cupola and sent back to the front line. These were designated (Sturm)Panzerkampfwagen KV-II 754(r) and were often used for artillery observation due to their height. 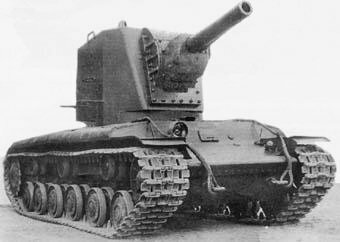 Perhaps the most interesting variant was a KV-2 armed with a 107 mm (4.21 in) gun. This was during a time when the superheavy tank concept was still being considered by Soviet leadership. There were no plans to serially produce a KV-2 with a 107 mm gun. Instead, just before the Siege of Leningrad, a KV-2 with a 107 mm gun was made and sent for fire testing in March, 1941. 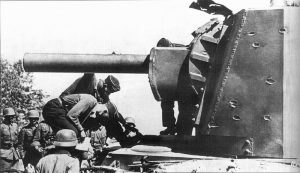 The 107 mm gun was going to be mounted on vehicles such as the KV-3, KV-4, and KV-5, but none of these projects left the drawing board as a result of the Siege of Leningrad. All 107 mm guns were destroyed and work on superheavy tanks was stopped. Due to its size and armored strength, it was nicknamed “Dreadnought” by its six man crews. The KV-2 first saw service in the Winter War as a prototype, as did many other vehicles. However, they were too late to test their might against the more fortified Finnish defenses, as they had already been overrun. Despite this, they still destroyed some remaining enemy bunkers and AT guns. Finnish AT guns were ill-prepared for the KV-2’s strong armor, and even reportedly stopped firing after three non-penetrations. 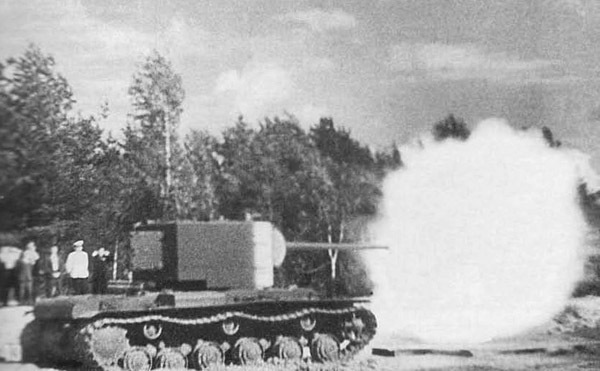 In the opening years of WWII, when the KV-2 operated in vast numbers, it was virtually invulnerable to direct fire from all but high velocity weapons at horrifically close-range. The best the enemy could hope to was force the KV-2’s crew to abandon the vehicle by disabling it, such as by hitting its tracks and wheels, but this did not always go to plan. A clear example of this was in June 1941, near Raseiniai. Roughly 20 KV tanks of the Soviet 3rd Mechanized Corps met the assault of the 6th Panzer Division, with approximately 100 vehicles. 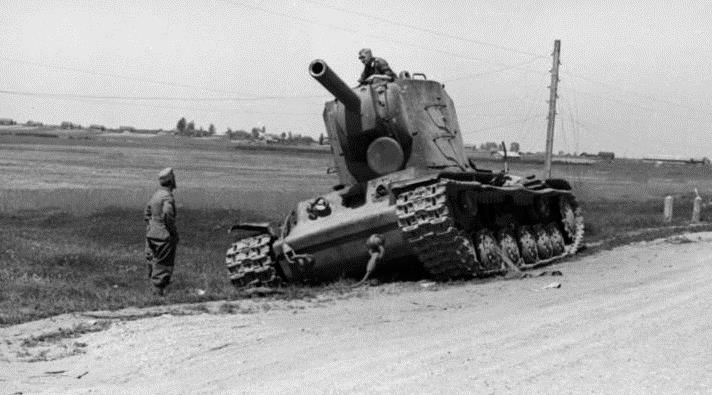 Another vehicle, probably a KV-2 tank, managed to hold off the German advance for a full day while being pummeled by a variety of antitank weapons, until finally the tank ran out of ammunition and was finally knocked out. Having said this, the KV-2 paid a high price for its immense gun and vast armor. Its mobility between engagements and during battle was heavily restricted by many of the initial gear and transmission problems that the KV-1 faced. This situation was made even worse by the fact that the vehicle now weighed 53.8-57.9 tonnes depending on the model, as well as by using the unimproved 500 bhp V-2 diesel engine. The road speed of a KV-2 was no more than 25 km/h (15.5 mph) and it only reached a mere 12 km/h (7.5 mph) off-road, making it a very slow moving vehicle. It was also prone to having trouble traversing the heavy turret if not on relatively flat ground. These problems all limited the flexibility of the KV-2 combat, but nevertheless, it was still a formidable opponent if dug into a strategic position. However, it lacked speed and mobility – two traits shown to be massively important in the opening years of the war. The worst problem for the KV-2 was by far its unreliability. The gearbox would often break easily, and the immense recoil of the gun meant that the small turret ring could jam, or the engine or gearbox could suffer severe damage. 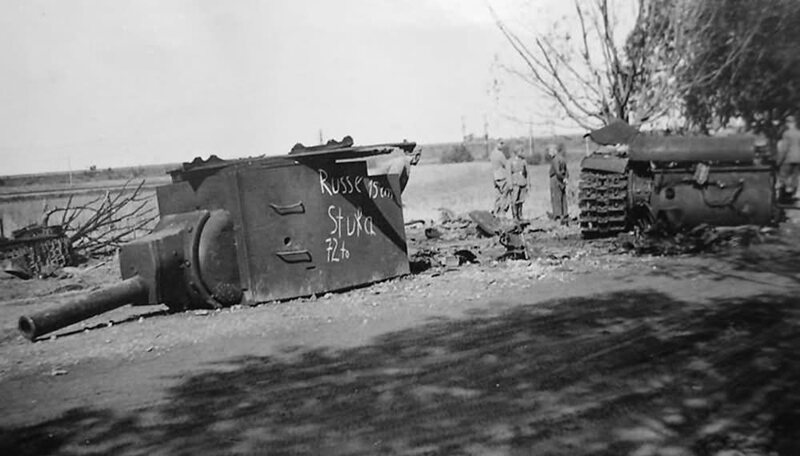 The majority of KV-2 losses in 1941 were due to breakdowns or lack of fuel which forced them to be abandoned. 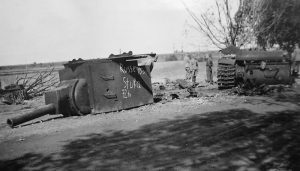 The 41st Tank Division lost two thirds of its 33 KV-2s, but only five were as a result of enemy action – usually landmines, as there were few insufficient AT guns or enemy tanks capable of knocking out a KV-2, and as it was used as a breakthrough tank, the KV-2 would often be the first victim of mines. Despite this, KV tanks came as a nasty shock to German invaders due to their resilience. They had no comparable tanks in strength, and few AT guns that could destroy them. KV-2, pre-production turret, 3rd Regiment of the 2nd Tank Division, Central front, summer 1941. 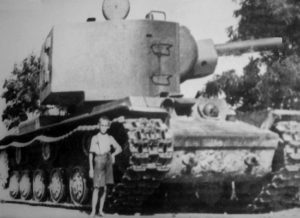 The KV-2 was globally an impressive but unsatisfactory model. 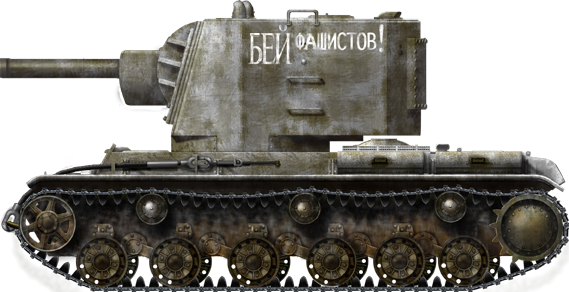 KV-2 in fictional livery. In reality, none are known to be painted with patriotic slogans. PzKpfw KW II 754(r), Panzerkompanie (z.b.v.) 66, Malta invasion force, 1941. Notice the Panzer III commander cupola and headlight. 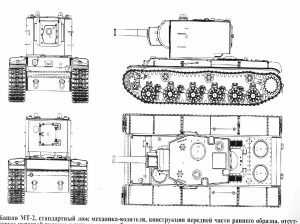 Blueprints of the KV-2, U-3 preseries prototype. 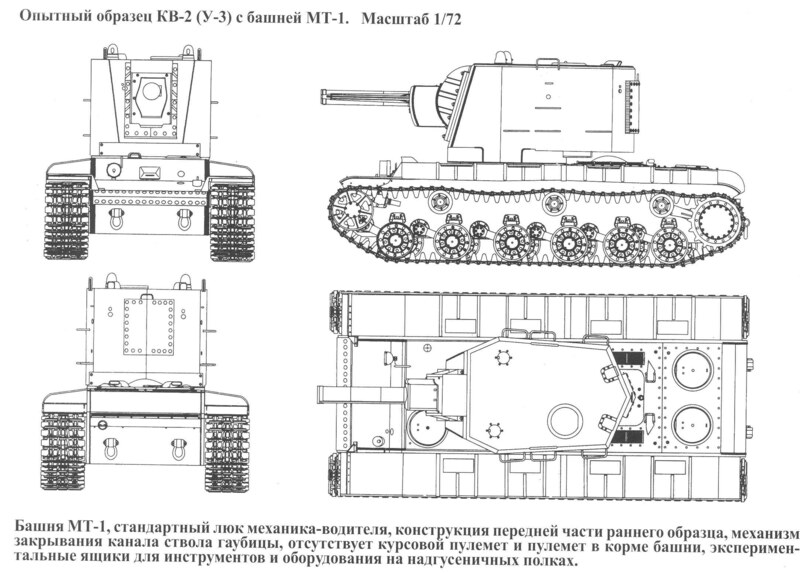 A technical drawing of the KV-2. A KV-2 of the 2nd Tank Division/3rd Mechanised Corps being inspected by Germans. Notice the numerous 37 mm (1.46 in) AT shells that bounced off the turret. Baltic area, June 1941, suspected to be the infamous Raseiniai KV! KV-2 displayed at the Central Museum of Russian Armed Forces, Moscow – Credits: Wikipedia. The U-3, a KV-2 prototype, February, 1940. A KV-2 with a 107 mm gun. 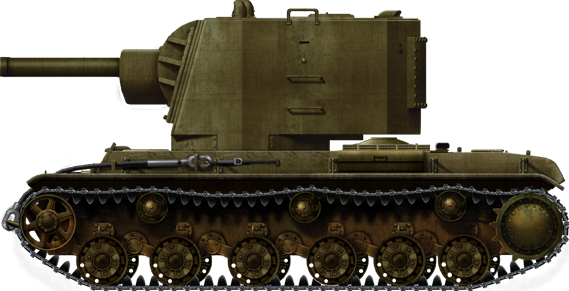 The KV-2 was similar to some superheavy tank projects the gun was intended for use with. I suggest that you remove the ‘Raseiniai KV-2’ as it is not 100% certain that it is a KV-2. Other sources state that it was also a KV-1 with an extra crewmember. We have reviewed the story and, indeed, it is not certain that it was a KV-2. We have modified the paragraph, but not removed it, as it an important and famous story about the KV tanks. It is most likely though. Another one, probably full of inaccuracies (didn’t even read the article; just judging from the title and images). 204 were built, not 334. There was never designation “KV-2A”. There was never “MT-1 and MT-2 turrets”; it’s an old myth going around. There was the “MT-1 artillery system” designed for installation on KV-2. “Captured KV-2A (MT-2 turret) displayed at Parola Museum, Finland” – There is only one KV-2 in existence in the Central Museum of the Armed Forces in Moscow; and that’s the one in your photo. “KV-2 model 1939, unknown unit, winter livery, Leningrad sector, December 1941.” – There is no evidence of any KV-2 with a slogan written on a turret. There is also no evidence that the last KV used (at Leningrad, in December 1941) had an early type of a turret. “The earlier model KV-2. 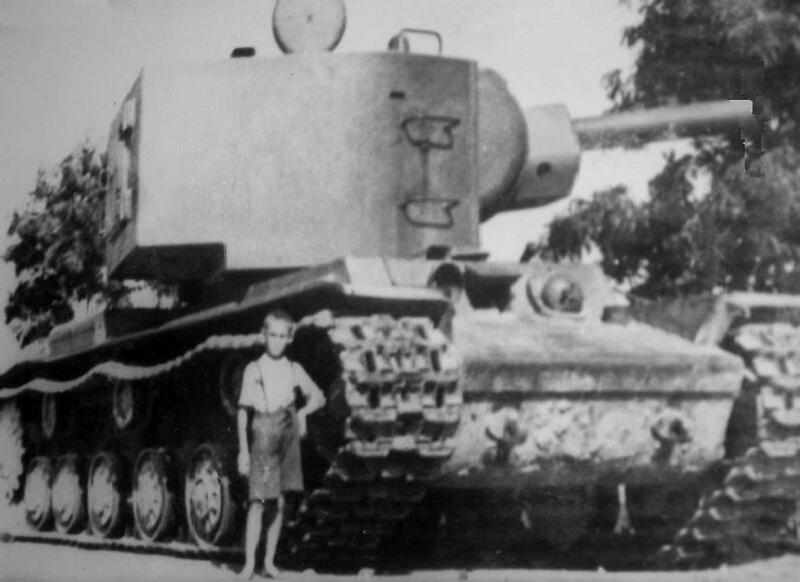 Note the MT-1 sloped turret.” – This is the U-3, the third produced KV-2 tank. February, 1940. As a matter of fact the whole western classification “model of 1939” is inaccurate as there was no KV-2 in 1939. The first experimental vehicle, the U-0, was built in February 1940. This article has been scheduled for a recheck. The team member who will rewrite the article will go looking for sources. Currently on the topic in our library are Maksim Kolomietz’ “Heavy Tank KV-2”, “Breakthrough Tank KV” and the Osprey “Heavy Tanks KV-1 & KV-2”. Would you suggest other books or sources? Why don’t you create your own website and they can use that? I love how many people come here to see all this fantastic FREE information and photos then just take it apart with smart-a*** comments because there are some inaccuracies. It will be added sooner or later as a Prototype of the Week! Question: The first KV-2 picture stats that 400 KV-2 were built by 1941 when production ended yet the top plac stats that only 204 were built. Corrected to 334. Most sources (but military factory that gave 255 total -and no sources as a backup) accepted 334: 102 in 1940 and 232 in 1941. “Most sources accepted 334”? Wikipedia numbers? Why does one need the questionable “most sources” if there are actual original WW2 production documents available that are clearly stating 204? This article is still marked as “to be remade” internally. The problem is none of our teammembers want to tackle it. The USSR had most of the tools needed to defeat the Germans but dithered and waited until almost oo late. Luckily winter was on their side. Correction: The USSR had close to nothing capable of defeating the German tanks early in the war. It wasn’t until the T-34/76 came around that they had adequate armour to defeat even a Panzerkampfwagen IV H. It wasn’t until the IS series that they could take down a Tiger II, as even the heavily armoured KV-1 couldn’t keep a Tiger 1’s devastating L/56 at bay. Okay, there’s a lot wrong with what you’ve just said there, through no fault of your own. Let’s define “early war” as Operation Barbarossa – June – December, 1941. Well, it did. Let’s assume that we’re not talking about aircraft or field guns and leave them to one side. Even if we talk about just tanks, you’re still arguing a tricky position. “German tanks” is such a wide array of vehicles, so let’s establish them as (broadly speaking), Panzer IIIs, IVs, and Panzer 38(t)s.
The 45mm 20kl gun, as seen on the T-26, was one of the best weapons of the early war. In fact, it was the best weapon fielded in the Spanish Civil War (excluding aircraft). A T-70, which used the same 20kl gun, was able to knock out Panthers on from 150-200m on March 26th, 1944. That’s a very interesting engagement to look up. 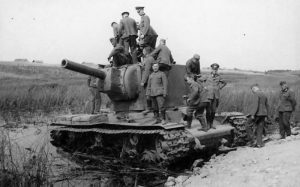 The 20kl was perfectly adequate at knocking out any early war German tank from short – medium ranges. There are three problems here. First, the T-34/76 was made in 1940 and saw action in 1941. 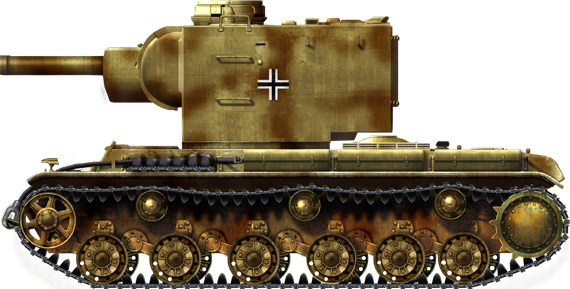 Second, the Panzer IV H wasn’t produced until 1943. Thirdly, the KV-1 used effectively the same 76mm gun as the T-34/76, and the KV-1 also came earlier than the T-34. I don’t really understand your point here. You talk about, presumably, guns of Soviet late-war heavy tanks fighting against late-war heavy German tanks in the first half of the sentence, and then switch to talking about pre-war Soviet heavy tank armour fighting a mid-war German heavy tank. 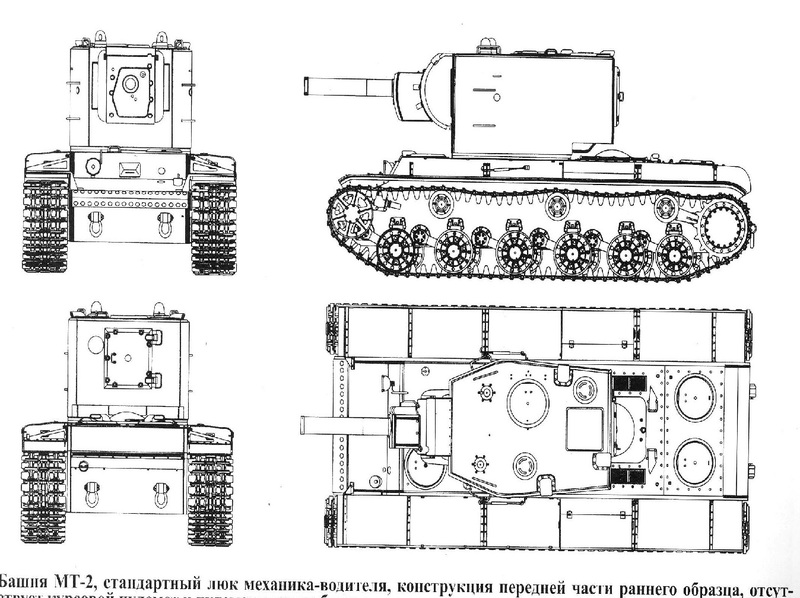 Again, still assuming that we’re talking about just Soviet tanks, this is, on paper, a somewhat accurate view. Looking more at the IS-122 than the IS-85 (and by extension, the KV-85, the T-34/85, and the SU-85), we can look at its gun. On paper, it would destroy a King Tiger. 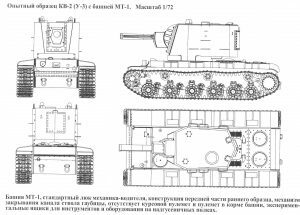 However, testing of the improved 122mm D-25T (which was used on the ISU-122S and the IS-122) in Kubinka in 1944 shows that it wasn’t actually that reliable. The tests suggest that a King Tiger’s turret could be penetrated from up to 1000-1500m, and the welds of front hull seams from 500-600m. Similar to the ML-20S, the D-25T could only manage up to 3 rounds per minute. Whilst these penetration statistics might make the D-25T sound more promising, they must be taken with some caveats. Firstly, to score such hits would require a very skilled and very experienced gunner – especially to score a hit on the turret from a range of up to 1500m. Secondly, these validity of these statistics have been called into question, because they come from Soviet sources. It wasn’t really designed to. It should come as no surprise that a pre-war Soviet tank cannot stack against a wartime heavy German tank. Were the turrets and armament of KV-2s ever installed in fixed fortifications? P.S Does anyone know how they reloaded it, i mean, they used a HUGH shell, i knew that is was by crane (I think) But how did the get the shell over the gun. Sean, that was the name of the engine. It was called the V-2 engine. For KV tanks engine, it was “V-2K” (to be more accurate), if I may add. There is a spelling error – it says ‘encounteri-ng’ when it should say encountering. I know it is a tiny error, but this is a website and everything should be right. If you play World of Tanks (Blitz) you can easily recognise WW2 tanks. Me and my brother can notice them very easily as a result. The Mannerheim Line was not nearly as fortified as this article leads one to believe; the soviet generals were requesting a bunker buster to try and justify their lack of success against it to their superiors. In reality, it was a (deep) trench reinforced with logs with some concrete bunkers here and there, so a bunker buster was never actually required. But there are photos of these with writing on them. Perhaps added after the war? 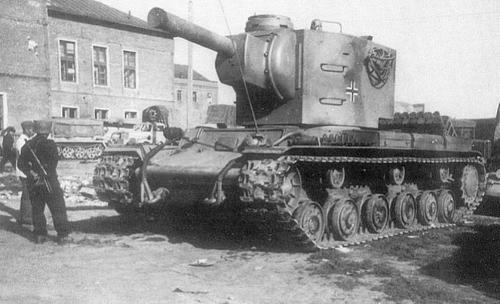 I found a image of the KV-2 with a 122mm gun! Alright! It is a cool find I discovered while combing the web. That is not a 122 mm gun Robert. That is a regular 152 mm gun. The recoil from a shot jammed it in this backward position, meaning there is something wrong with its recoil system and recuperator. Probably sabotaged by the crew before bailing out. We knew this, and it’s the core principle behind the KEP/LRP type rounds (now familarly called “arrows” or “darts” and more generally “sabot”) in service today as #1 antitank rounds. Technically called APFSDS-T rounds they were first developed by the British in 1941-1943 as APDS.